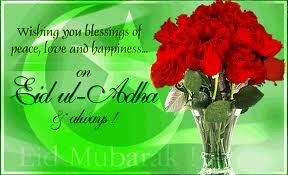 Id-Ul- Zuha(Bakri Id) will Celebrated on 27 October.This Festivals is Muslim Festival. Id-ul-Zuha (Bakr-Id), is a festival of great rejoice, special prayers and exchange of greetings and gifts mark this festival of Muslims. 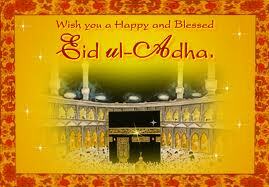 Id-ul-zuha, the festival of sacrifice is celebrated with traditional fervor and gaiety in India and the world. It is called Id-ul-Adha in Arabic and Bakr-Id in the Indian subcontinent, because of the tradition of sacrificing a goat or 'bakr' in Urdu. 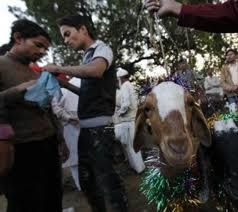 The word 'id' derived from the Arabic 'iwd' means 'festival' and zuha comes from 'uzhaiyya' which translates to 'sacrifice'.On this day Muslims sacrifice a goat or Bakr (Urdu) to commemorate the sacrifice of Prophet Ibrahim, who willingly agreed to kill his son at the behest of God. The festival coincides with the anniversary of the day when 'Quran' was declared complete. It is from when many Muslims undertake Haj to Mecca and people offer prayers in mosques. On the day of Id, the pilgrims reach the grounds of Mina where they sacrifice an animal each. It was here that Ibrahim is believed to have sacrificed his son. The pilgrims then shave their heads. The purpose is to be one with the millions of devotees who converge to Mecca each year for the Haj. The sacrificial meat is distributed after the ceremony among friends and family members. Special delicacies,Recipes and sweets are prepared on the occasion. 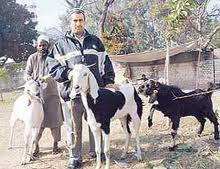 The celebration of Bakri Id starts from the tenth to the twelfth day in the Islamic month of Dhu'l Hijja. On the Id day people wear new clothes, offer prayers, and visit each other and exchange greetings. 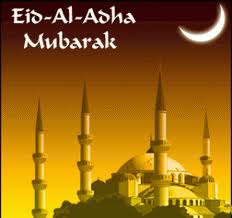 There are special prayers, which take places on the three days of Id. Ceremonial prayers, and feasts are part of this festival. 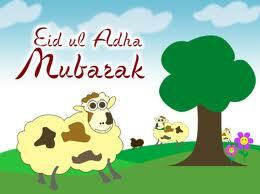 Eid Al Adha or Eid ul Zuha or Bakri Id is one of the most important festivals in the Muslim calendar. Celebrated from the 10th to the 12th day in the month of Dhul Hijjah, this festival is significant with the sacrifice of the goat or bakr in Urdu. 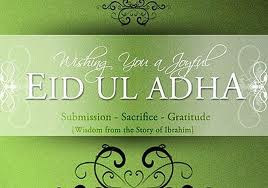 The word Id derived from the Arabic Eid means 'festival' and 'zuha' comes from uzhaiyya, which translates to 'sacrifice'. Eid Al Adha commemorates Prophet Ibrahim's willingness to sacrifice his son on God's command. According to Islamic belief, to test Ibrahim, Allah commanded him to sacrifice his son Ismail. He agreed to do it but found his paternal feelings hard to suppress. So he blindfolded himself before putting Ismail on the altar at the mount of Mina near Mecca. When he removed his blind-fold after performing the act, he saw his son standing in front of him, alive. On the altar lay a slaughtered lamb. It is in honor of this test of faith that Muslims around the world sacrifice an animal on the occasion to show their faith, allegiance and sincerity to Allah. 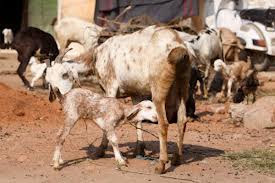 In India, the animal used mostly for sacrifice is the goat, which is why the occasion is spoken of in Urdu as Bakhr or Bakri-Id. 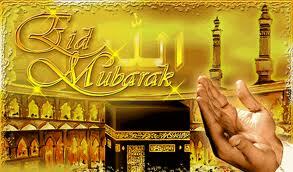 The festival also coincides with the anniversary of the day when The Holy Quran was declared complete. It is also the time when many Muslims undertake Haj to Mecca. For the millions at Haj in Saudi Arabia, it is an auspicious day. 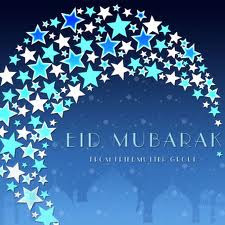 Being a lunar date, Eid depends on the sighting of the moon. According to the customs the pilgrims at Haj collect seventy pebbles that are used to drive away the Shaitan or Satan who tried to dissuade Prophet Ibrahim thrice from making the supreme sacrifice. This gesture marks the symbolic condemnation of evil power that tries to dissuade man from reaching God. On the day of Eid, the pilgrims reach the grounds of Mina where they sacrifice an animal each. The pilgrims then shave their heads. The purpose is to be one with the millions of devotees who converge to Mecca each year for the Haj. In India, the day begins with a ghusl or bath, after which namaaz is offered. It is mandatory to sacrifice either individually or collectively if one cannot afford the full price of the animal. To a Muslim it is the word of Allah that has to be followed. 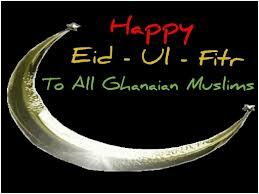 The sacrificial meat is then distributed amongst family, friends and the needy. 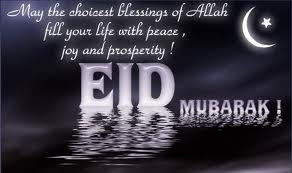 Prayer meetings and Eid Milans are part of the festivities. People visit friends and relatives wearing new clothes and jewellery. Children are given idi or gifts and money. In the Indian subcontinent sweets are exchanged. Vermicelli or seviyan, a traditional sweet, is prepared specially for this festival. 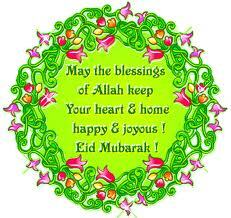 With a lot of happiness like this Eid Day! 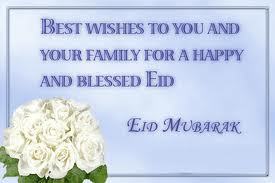 Wishing U a Very Very “Happy Eid Mubarak”With Luv And Best Wishes. 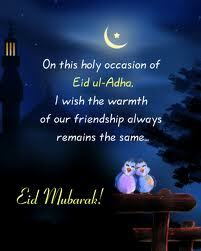 May This Eid Day Brings Lot of Happiness And Joys in ur Life. or Mehakta rahay pholon sa chaman EID ke din.